Only a few hours ago I was watching the match between Leicester City (Under 23s) and Sparta Prague B, live at the stadium as part of an up-skilling programme I’m taking on to further distinguish myself in my field of personal health & fitness consulting. It amazes me as to what goes into the moulding of a player into a professional and I’m happy to report that the course I was undergoing taught me a lot about what it takes on a preparation level, so I have a lot more to offer my clients now. While I’m enjoying the final hours of what was indeed originally a business trip of sorts, allow me to entertain my alter ego as a travel blogger just for one post, as I truly believe the many experiences of the destination away from the core business of the trip are worth sharing. 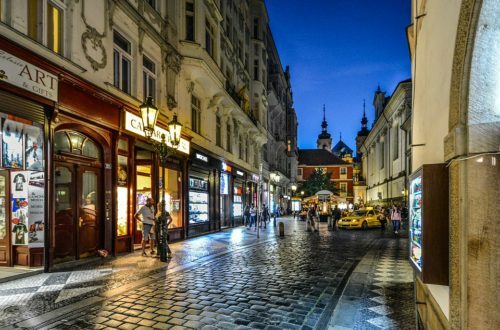 Exploring the streets of Prague and enjoying the local entertainment made for a truly eye-opening experience of what is admittedly growing into quite the popular travel destination, but mostly amongst backpackers in particular. The city is relatively safe compared to many other cities which are growing increasingly popular all around Europe, so I got around on a bicycle I’d rented, securing it with a bike lock of course whenever I had to leave it outside somewhere. So not having to spend any money on transportation ensured that I could stretch every last one of my dollars even further! Already, it’s an inexpensive city as compared to many other cities all over the world in fact, when taking into account all which it has to offer. I have it on good authority that if you really don’t know what’s what you can be coaxed or outright cheated into paying about 30% more for a taxi than what an Uber would cost to get around, but that’s probably just representative of the many tourist traps which rear their ugly heads in any city with an increasing focus on tourism. So you’d probably just need to do a bit of research and you’ll be fine as far as transportation goes, especially with regards to how much you’d have to spend. The ability to enjoy a good time with all the good things that modern life has to offer, without breaking the bank is most definitely the biggest takeaway I can claim to have been in on while in Prague. For example, what would constitute a bit of splurging at a fine dining establishment still doesn’t really compare to what I’d get spending the same amount of money in a city like London. You get a lot more bang for your buck in Prague, and speaking of dining, it’s never just about eating. Normally you’d enjoy your meal as a culinary experience which is infused with a bit of a cultural experience, which is why a dining establishment would be located a mere stone’s throw away from an art museum, as an example of how pretty much everything is organised.